The Bombtrack Bicycle Company is a German brand that started out by specializing in singlespeed and fixed gear bikes. 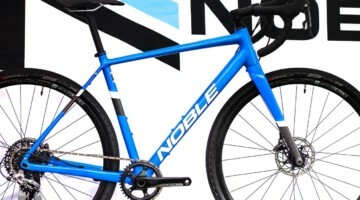 Business has been good as the company has expanded its lineup to include 17 different bikes ranging from steel fixies to aluminum adventure bikes to carbon cyclocross race rigs, and has expanded across borders by entering the U.S. market. "Well the truth is we can’t even remember any more, extreme, extended, extraordinary…take your pick." The 650B/27.5" wheels and custom frame and fork spacing allows riders to use mountain bike rubber on the Hook EXT. 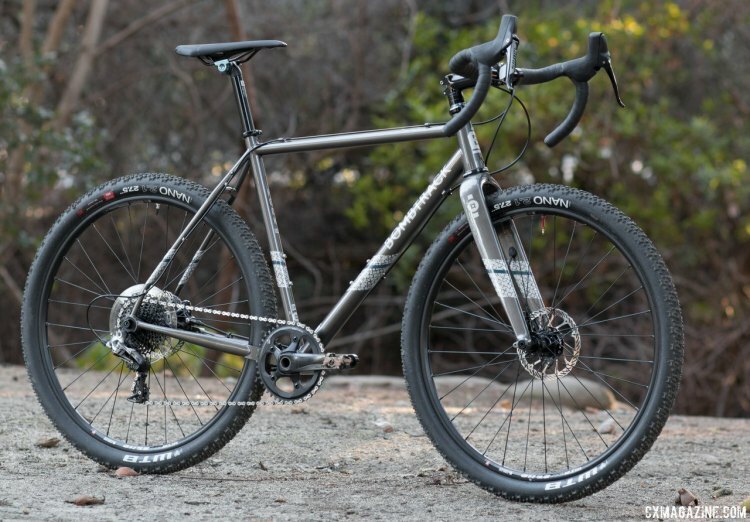 Riding big wheels on adventure road and ’cross bikes is a growing category, with bikes like the Van Dessel A.D.D., 3T Exploro and Open Cycles U.P. all officially embracing dual wheel diameters. While Fox looks to expand your drop bar riding options with an upcoming Adventure Cross suspension fork, Bombtrack opts for the simpler path of soaking up the bumps of more technical terrain with bigger tires. The comfort, traction and confidence that come with a bigger contact patch is a simpler way to expand the terrain options for your drop bar rides, providing you have the tire clearance. 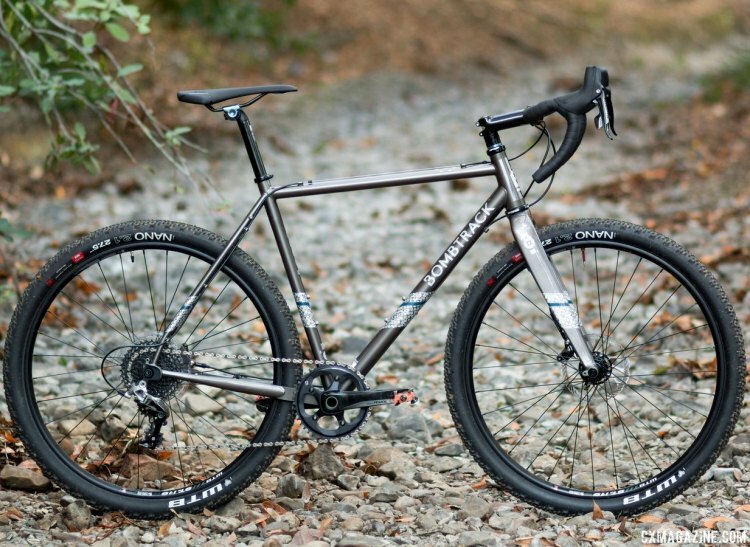 Knowing the bike might be an ideal offseason gravel / trail bike, we opted for the EXT model. The Bombtrack Hook EXT combines the geometry of a cyclocross bike with the grip of a mountain bike tire by design thanks to a specially designed frame that utilizes a wider bottom bracket and yoke to maintain a wide yet short rear end with 42.5cm chainstays. The frame is made from Columbus double-butted Cromor tubing, adding a bit of Old World pedigree to a New World category and riding style. 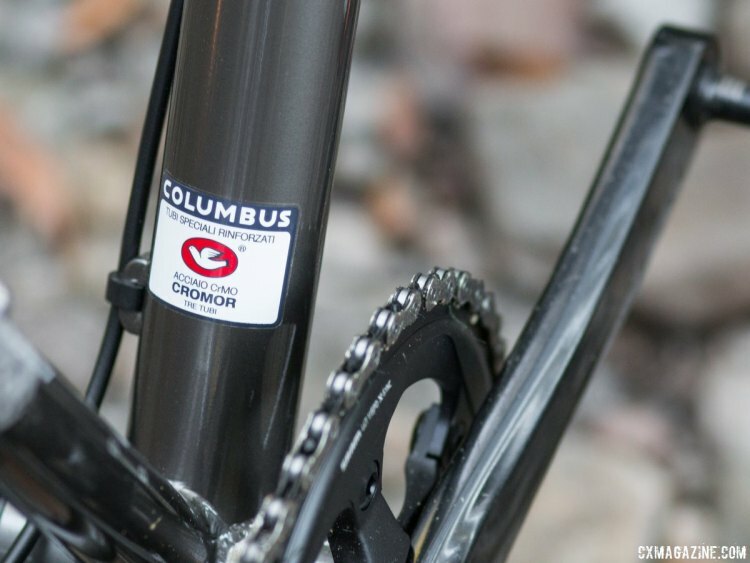 The Cromor cromoly tubeset is seamed, drawn and double-butted, a bit heavier and reportedly stronger than the classic Columbus SL tubing. 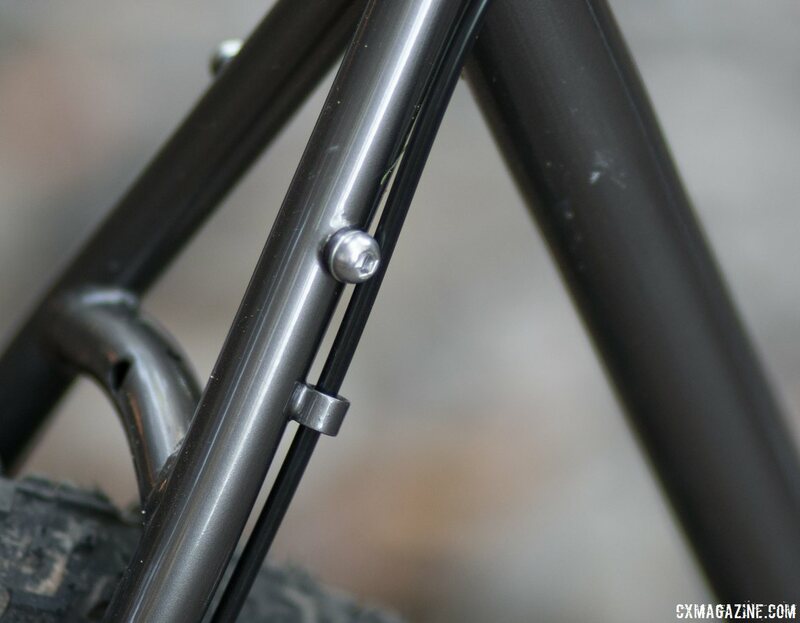 The Hook EXT's fork was developed specifically for this bike and has an extra wide crown that offers plenty of tire clearance. 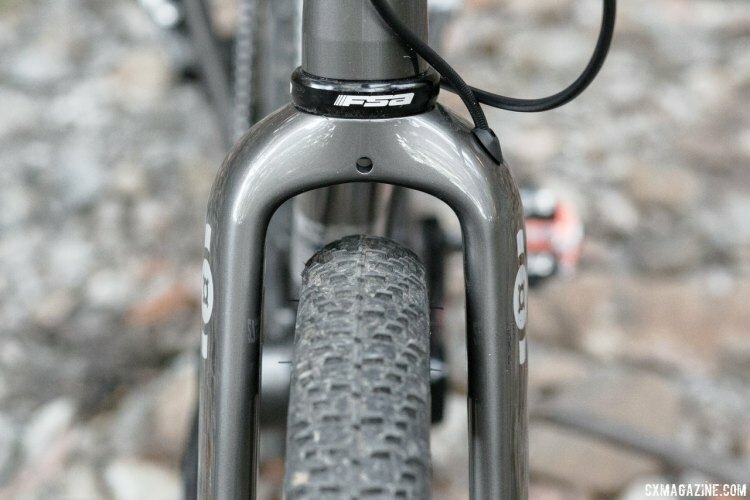 The carbon fork features an alloy steerer that is tapered from 1-1/2" to 1-1/8" and is built to handle the rough stuff. Have aspirations of hauling some gear and riding out to the campground or to your next gravel race? 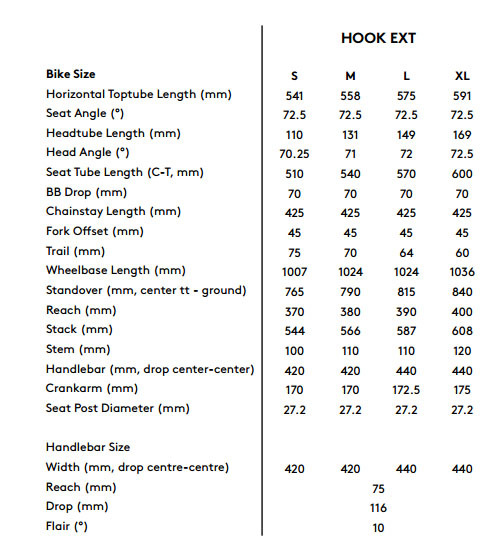 The Hook EXT is ready for the long haul, with fittings for a rear rack and front and rear fenders. 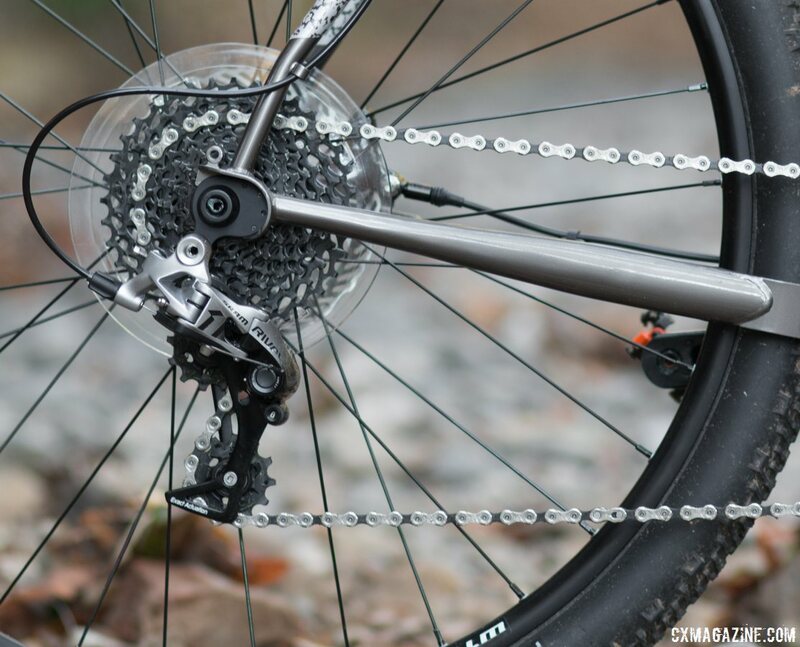 The Bombtrack Hook EXT is outfitted with SRAM's Rival 1 single chainring drivetrain with a 11-36 cassette. Up front, the company opts for a big 44t X-Sync chainring. The 44x11 is a tall gear, but the 44x36 low gear might have you out off the saddle, searching for something lower. 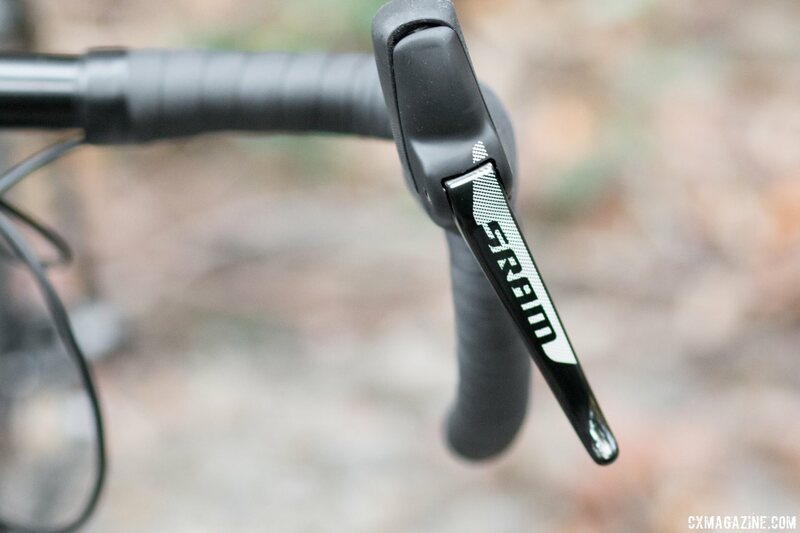 SRAM Rival hydraulic disc brakes handle the stopping duties. The WTB STS rims are matched to BT Bikes Origin hubs with 15x100mm front and 12x142mm rear axle spacing, with thru axles of course. 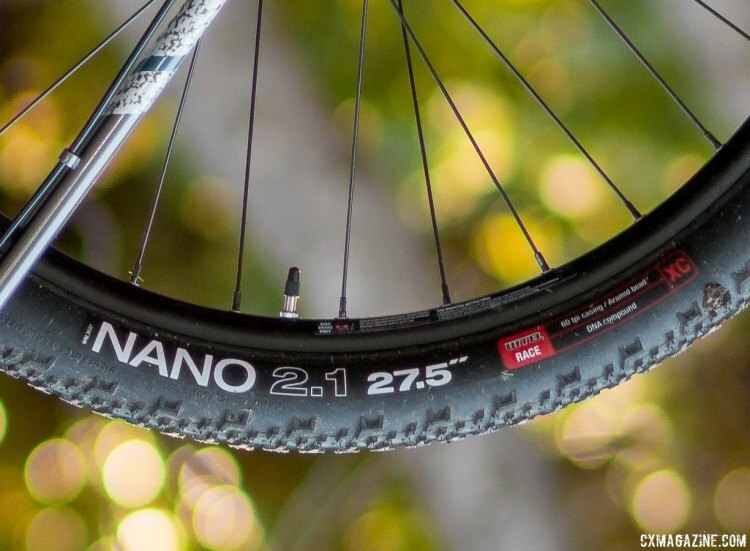 WTB Nano 27.5"x2.1" tires come standard, and it's the lighter, more supple "Race" version. They're not WTB's TCS tubeless versions, since WTB does not make the Nano TCS in a 27.5" size yet, but we converted them to tubeless anyway. The cockpit is all Bombtrack's BT Bikes housebrand components, with some nice touches. The bars feature a 10° flare, which adds some width in the drops but places the levers with an odd, angled-in position. The seatpost offers easy angle adjustment and a touch of blue anodized color, although lacks the two-bolt design we prefer for ultimate saddle security during sloppy remounts. If your definition of gravel riding includes technical, rocky or loose terrain, the Bombtrack Hook EXT should appeal to you. It's a blast to ride on your local mountain bike trails, and really shines on rocky terrain and steep climbs. 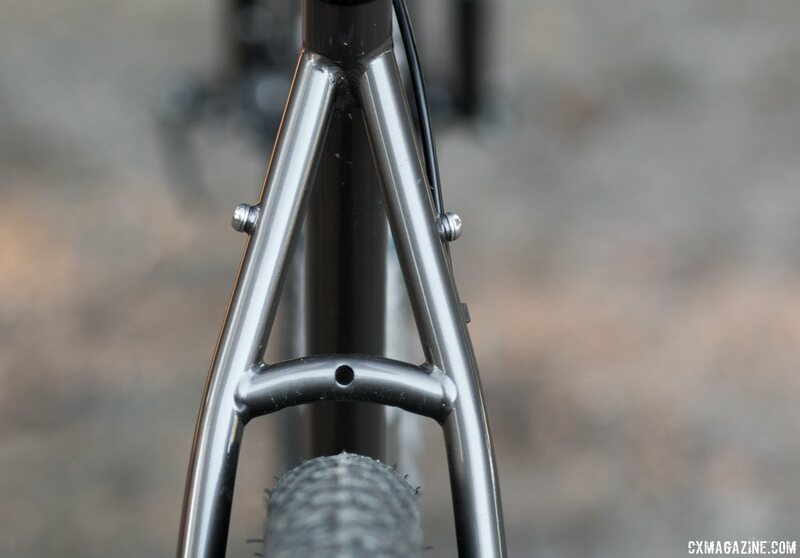 Most bikes stretch out the chainstays and slack out the head angle to make room for bigger rubber, but Bombtrack pulls off an engineering feat fitting the big tires into a frame geometry that looks quite standard for a modern cyclocross bike. Short, 42.5cm chainstays, a low 7cm BB drop and short (102.4cm) wheelbase on our Medium test bike made for a familiar ride that encourages you to explore unfamiliar areas at unfamiliar speeds. Areas that typically have you slowing to a crawl, worried about flatting or denting rims, will now be an exercise for your grin muscles and forearms as you justify the company's odd name. If you're used to climbing on 33c cyclocross tires, you'll be especially impressed tackling the same climbs with the large footprint of the 2.1" rubber. Loose or slippery climbs are certainly less of a challenge with all that tire underneath you, as our riding buddies have witnessed. That grip is helpful, because if you're anything like us, on long and/or steep climbs, you're likely to find yourself overgeared. The stock 44x11 gearing ensures you won't be spinning out on the flats when you chase the roadies, or bomb down the track on a downhill. It's when the trail points up that we think many owners might prefer a lower gear. A 44x36 low gear is quite tall by today's standards, and we're not ashamed to say we'd prefer an SRAM XD 10-42 cassette, or a SRAM Apex or Shimano 11-42 cassette out back and a smaller 40t up front for easier spinning when the road points up, especially on longer adventures. 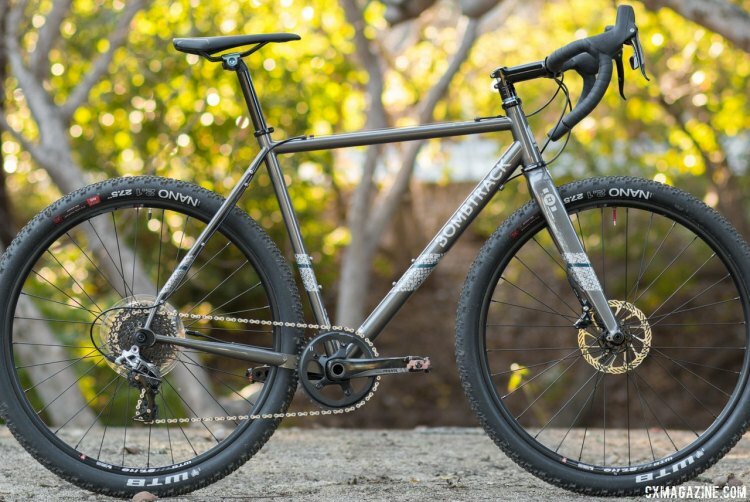 For an adventure-oriented bike, the tall gearing is a miss, but something the can easily be resolved with a new ring or longer chain and wider cassette. The flared bar is quite nice, but the angled-in levers took a bit to get used to. However, given that the Bombtrack EXT, with its big tires, ended up pushing its way to the front of the quiver for a few weeks, we quickly got use to the hand position. It's one of the stronger contenders for the one-bike title, and a bike we wouldn't be afraid to line up on at a cyclocross race, especially an early season one with rock-hard dirt that demands more volume for lower rolling resistance and to keep your teeth's fillings. Know you're going to tackle thick peanut butter mud in a race? Outfitted with cyclocross tires, you've got best-in-class tire clearance to make sure you're riding past mud-clogged competitors while they're yelling for their pit crew. The Bombtrack is not light at 24.5 pounds, and you'll certainly feel that steel tube on your shoulder during an extended run-up. However, the 15.1 pound weight without wheels suggests that when armed with a pair of lightweight race wheels, the Hook EXT could approach 20 pounds. We haven't done that yet, but plan to soon. Stay tuned for a longer-term test in our long-awaited print magazine's Adventure Issue. See our full photo gallery below the specs. Headset: FSA Orbit ITA sealed a-headset, tapered 1.1/8"-1.1/2"
Tires: WTB Nano 27.5" x 2.1"
Next post Interview: Sharon Sloan on Racing Her First Cyclocross Nationals - "This Is Better Than Being Dead"